Over on his Livejournal, Neil Clarke has been doing some analysis of short fiction category of the Locus Recommended Reading List. The numbers are quite an eye-opener. I knew we had done well, but it hadn’t occurred to me as even possible that we would tie with Asimov’s for the most selected stories. We did, with 7 each. Am I proud? You bet! The trend towards fiction from online venues continues, and this is the first year that more short stories have come from online venues than from print magazines and books. Also worth noting is that 38 of the 68 stories are by women. Six of Clarkesworld’s seven recommended stories are by women. Meanwhile on Twitter there has been a great deal of fuss. It has been created by what I’m starting to think of as the UKIP wing of British fandom, because the people concerned are constantly whining about being oppressed by Locus and the Hugos in pretty much the same way as right-wing tabloid newspapers whine about being oppressed by the EU. There story here is that a vicious cabal of Evil Americans (such as Jonathan Strahan, John Clute, Graham Sleight, Farah Mendlesohn, Tansy Rayner Roberts and myself) gather together each year to plot the downfall of British science fiction by picking only American works for the Recommended Reading List. This year, apparently, we were worse than usual, with the list being hideously skewed towards US writers, magazines and publishers. That, of course, is all part of my Evil Plan. So I decided to look at some numbers to see how Evilly I had done. There are 17 novels on the science fiction list. 11 are by Americans. Greg Egan is Australian. Canada would kill me if I identified Bill Gibson as American, even though he was born there. Johanna Sinisalo is Finnish. And three (McDonald, Reynolds, Banks) are British. That gives us 11.5 Americans to 3 British, which is about what we would expect. Must try harder! On the Fantasy list there are 24 novels. 14 are by Americans. Michael Ajvaz is Czech, Lauren Beukes is South African, and Guy Gavriel Kay is Canadian. The other 7 (Fforde, Fox, Gilman, Miéville, Mitchell, Pinborough and Stross) are all British. So that’s a ratio of 14:7. And that, apparently, is hideous anti-British bias. Hmm. The one that surprised me was the First Novel list. Of 15 entries, 11 were by Americans, but there was not a single Brit amongst them. At last, my Evil Plan is working. Possibly. I’ll come back to it in a minute. Of course if you are of a UKIP frame of mind there’s little that can sway you from your feelings of oppression. There is always some excuse for why things that are doing well and appear to be British are in fact not so. For example, some of those “British” writers live in America (Gilman) or, heaven forbid, in Edinburgh! (Stross). Then again, most of them have US publishers as well as British contracts. This, I suspect, will be held up as evidence that they are writing “American” fiction, and therefore don’t count. The assumption being that if they wrote “British” fiction it would be too intelligent and left-wing for an American audience and American publishers would not buy it. My explanation is a little different. The US publishers are well aware that British writers are very good, and so anyone from these isles who gets a bit of critical attention gets snapped up for a US contract. As the UK market is much smaller, it is much less likely that a successful US writer would get a UK contract. Complicating matters is the international nature of publishing. Orbit, for example, tend to buy world rights to books, but it is British editor Tim Holman, based in New York, who calls the shots. Angry Robot has a US branch, but they are headquartered in Nottingham. One area where you might expect British publishers to score is in First Novel, because the writers there might be people who were discovered by a UK operation and have not yet got a US contract. As I noted, none of the First Novel authors are British. However, three of the four non-US authors were first contracted by British publishers. That’s Terry Dowling (Australian), Hannu Rajaniemi (Finnish) and Lavie Tidhar (Israeli). So the reason why there are no British authors on the First Novel list is, at least in part, because British publishers are looking outside the UK for new talent. Finally a brief word on magazines. The absence of Interzone from the list is obviously a clear indication of anti-British bias, right? All the other magazines are “American”. But, as noted above, a lot of the short fiction is now coming from online venues. That means that they are edited by Evil Americans like me and (as of this year in the top job at Strange Horizons) Niall Harrison. 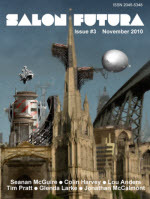 I took a look at the numbers for Clarkesworld’s 2010 stories. 14 of the 24 were by Americans. 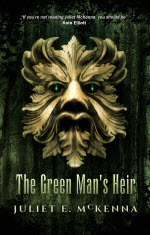 The other authors came from a variety of countries including two British and one Irish. Non-fiction is mostly American, but I get so few submissions that it is really hard to get much diversity into the selection. In cover art, however, where excellent command of English is not required, the picture is quite different. Only 3 of the 2010 covers were by Americans. There were 2 from Brazil, 2 from Turkey, and one each from Russia, France, Bulgaria, the Phillipines and Mexico. 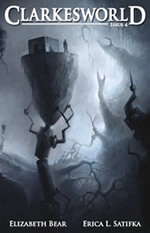 So yeah, clearly Clarkesworld is an Evil American magazine. Anyway, enough bashing of the English for now. Time to watch them getting bashed on the rugby field instead (I hope). This entry was posted in America, Clarkesworld, Science Fiction. Bookmark the permalink. I think you are missing a nuance. Read that list again. I think that as Johnny Foreigner you count as an Evil American anyway. You are from South America, aren’t you? Cheryl – this post gave me a laugh. Must admit that I felt a little out of step myself on reading the Locus recommended list this year, but I wouldn’t have said my immediate assumption was one of bias. I find that a huge conclusion to jump to, but even if it were (subconsciously) so, so what? Locus is an American magazine. They can recommend what they like. Locus’s list has always been a good barometer but it’s not the only one, and don’t Vector’s reviewers provide their own best of year suggestions? If there were discovered to be more British writers on that list would that also be bias? I did however feel that Interzone’s output from last year deserved a little more of a big-up – or at least Nina Allan’s work, which I think is exceptional, but I didn’t manage to read as widely last year as I normally do (although I did enjoy quite a lot of Clarkesworld) so perhaps I’m just out of step with what people consider to be good at the moment. Must expand my Twitter following so not to miss out on the good stooshies in future. I can’t comment on the absence of Interzone stories as I’m not privy to those discussions, but I do think that the Internet is making nationality much less important. As I pointed out, Clarkesworld publishes a lot of non-US authors. Interzone recently devoted an entire issue to an American author, Jason Sanford. What does it mean to be a “British” or “American” magazine when most of the stories are published online and magazines have multi-national editorial boards? That’s a good point. In fact I think I saw some gripe somewhere in the last week or so about Interzone publishing more American writers in what was supposed to be a “British magazine”. Which kind of proves what you’re saying. Locus’s list has always been a good barometer but it’s not the only one, and don’t Vector’s reviewers provide their own best of year suggestions? Vector’s reviewers do provide their own best of year suggestions and books by British authors accounted for six of the eleven novels that made our top ten. But Vector is a very different beast to Locus and I think it is disingenuous to suggest Locus is just an American magazine. Vector is a magazine run by volunteers with reviewers drawn from the membership; Locus is a professional magazine with paid professional reviewers which aspires to be the magazine of the field. In asking my reviewers for best of suggestion, I am asking for their personal choices and whilst they are discerning but they are unlikely to have read a significant chunk of what has been published. Locus, on the other hand, aim to be both authoritative and comprehensive and its reviewers (and others) work collaboratively to produce such a list. The result is an extensive list that tends to the inclusive. So I think there is a tension between Locus as a local American magazine and Locus as a the journal of record for science fiction and fantasy. This tension is also there in the voting issue that Jeff mentions below. Is it a poll for the subscribers or is it a popular vote? Similarly, is the recommended reading list a survey of the the US publishing industry or the genre in general? To take a specific example of this tension as it applies to regionality, New Model Army by Adam Roberts came second on the Vector poll but doesn’t appear on the recommended reading list. Did the compilers of the Locus list exclude it because Roberts is British? No. Did they exclude it because New Model Army doesn’t deserve a place on the list? Perhaps but I doubt it. Did they exclude it because it doesn’t have a US edition? Almost certainly. Did they exclude it because it doesn’t have a US edition? Almost certainly. Oh, really? Good so see that my anti-British bias is showing there. I was beginning to doubt my capacity for evil. Fair distinction, Martin, I take that point. There’s also the old saw though that any review magazine can only consider what they are sent and the Locus Rec List was preceded by the caveat that made it sound that the Locus staff felt they weren’t being sent a lot of stuff they’d heard about, especially from the UK. So, without getting into specifics, maybe there’s a disconnect there? Or maybe it just comes down to some books or stories not working for one group of people as well as it does for another group of people, irrespective of nationality or location, but just in terms of personal taste. Checking my email logs, at least three people who live in the UK have input to the novel list. Farah was moving home at the end of last year and may have dropped out because of that. And while British small presses may not be able to afford to send books to Locus, Gollancz surely can. PS Publishing has a novel and two novellas on the list. If there was deliberate anti-British bias, surely they would not be there. And then there’s the Sinisalo: a Finnish author published in translation by a British literary small press. But we heard about it, we got hold of it, and we listed it. Yellow Blue Tibia was listed last year despite only having US publication, because lots of those involved in putting the list together thought it was a great book. No one is perfect. We do miss things, and there are all sorts of reasons why that might happen. But deliberate bias against British publishers is not one of them. So, without getting into specifics, maybe there’s a disconnect there? I’m sure that disconnect exists and it is at least partially what I am getting at. For Vector, I rely on books submitted and these are predominantly British so whilst I aim to cover the field as widely as possibly, this is explicitly the British field. There are very many important books which are only published in the US which we don’t review (even though I would like to). This is perhaps forgiveable in a magazine run by the BSFA. Which brings us on to the question of personal taste. Yes, it is possible that even though a book wasn’t published in the US, the compilers still saw it but simply didn’t like it. It is certainly possible. However, it is my understanding that personal taste isn’t intended to have much of a role in the Locus recommended reading list. Last year’s list spoke (slightly mysteriously) of “inputs from outside reviewers, other professionals, other lists, etc”. So I don’t think it is right to simply consider it a list of things the Locus reviewers and editors like. Even the title of the list is important; it is a “recommended reading list” and it has no fixed size, it is a list of everything that was considered worthwhile in 2010. I’d be more concerned about the presence of anthologies and books by Locus staffers on the list, which is influential in helping determine the final ballot. I contribute to the Amazon SF/F top 10 list and am permanently recused from appearing on that list; it’s also incredibly improbable that I would ever appear on the top 100 list for the same reason. This is no idle threat, as I regularly appeared on the top 10 list before I started contributing to it. I know this is a difficult issue, and I can see a lot of sides to the argument, but I think that Locus might want to look at tightening restrictions. There are plenty enough year’s best lists and awards in the field that tightening wouldn’t be unduly restrictive. And at the same time, they need to broaden who is giving them intel about stories, etc. It is of course difficult to talk about. Yeah, it is very difficult. They do solicit recommendations from a much wider pool these days. The list of contributors on the site mentions “others” which include Clute and myself. I don’t know who is on the short fiction list. But basically with such a small, friendly community it is almost impossible to be totally neutral. As a contributor to the Locus list, I rec stories from the publications sent to me for review. Publications that aren’t sent to me, I don’t read and can’t rec. There are a number of stories on the 2010 list that I hadn’t seen and therefore couldn’t comment on, but there were a lot more stories that -aren’t- on the list that I hadn’t read and couldn’t rec, even though I might have been happy to do so. I don’t think this is so hard to comment upon. If publishers are concerned about stuff appearing on these lists, they need to do more to get it into the hands of reviewers and contributors. Let me preface this comment with a default I’m coming from: It’s incredibly difficult to do a monthly magazine of the sort Locus does. It’s an excellent resource and I feel a little weird talking about process with regard to them because they’ve often been very kind to me. I read the darn thing every month, so they’ve got me hook, line, and sinker. But precisely the point that Lois raises is why it’s important to perhaps cast a wider net re soliciting opinion. As for staff books and anthos, it’d be fair enough to just list them under a category of “By the staff in 2010” for example and leave them off the online rec list check boxes but still prominently displayed. At least some show of separation would be a good thing. Cheryl–at this point, given the web standards of transparency, the “and others” is bothersome. There is no reason why they can’t just list who they consulted. Without doing so we have no idea if they go to the same people over and over again or if they mix it up. Certainly, they can continue to leave it vague, but it’s not a ma-and-pa store, so to speak, anymore. It is as I think Martin said above the journal of record. I pretty much agree with this. It doesn’t do me any good that they don’t mention my participation in the creation of the list, though I’m sure that there are people who will think less of the list if they did. I also think that there are many areas where coverage could be improved. The material you provide on non-English-language books for the web site, for example, culled from a group of experts around the world, could perhaps be incorporated. There are also types of books that I don’t think we cover very well because there isn’t enough breadth of taste in the existing group. I can see all sorts of ways in which the existing list could be legitimately criticized. The relationship between the Recommended Reading List and the voting form for the Locus Awards is also an issue that is up for debate. However, I think that the charge that the list exhibits anti-British bias is not only unfounded, I think it is a selfish piece of jingoistic nonsense. I think these are two separate issues. One is conflict of interest, or at least the perception of it. The other is breadth of input. I know that the staff attempts to collect a group of reader/reviewers who read very widely in the field and offer informed opinions. I’m not so sure it’s going to be useful to have other people supplying lists of recommended works from obscure sources if these works aren’t made available to the recommenders, and in a timely manner to allow them to read and evaluate. When I look at Neil Clarke’s charts, the first thing that comes to my mind is: of course there is an increasing present on the list from online venues. The stuff from most online venues is openly available. If someone recommends a work from an online site, others can easily access it. If someone recommends a work in print from an obscure press in Tasmania, how easily can it be obtained? There is a bias in favor of availability, and this works in favor of works published online. Actually, if you look historically at the numbers, for that category one of the major reasons that online fiction has gained isn’t because of accessibility, per se . . . it’s because recommendations from both print magazines and anthologies have gone way down. One reason could be that, well, those weren’t great years for either. For instance, last year’s extreme jump from 28% to 53% correlates to a massive drop-off in anthologies, along with a continued decrease in print magazine representation. (Example: For 2007-2008, anthologies like Clockwork Phoenix, Del Rey Book of SF / F, Eclipse, Fast Forward, Solaris, constituted 20% of the recommended reading list. Take those out of the equation . . . well, you get what you see, for 2009-2010) The big question is whether or not we’ve hit rock-bottom, with both, because there is no more gains to be hand without attrition in those two categories. But I’m not too convinced it’s an accessibility issue. It has been created by what I’m starting to think of as the UKIP wing of British fandom, because the people concerned are constantly whining about being oppressed by Locus and the Hugos in pretty much the same way as right-wing tabloid newspapers whine about being oppressed by the EU. In 2010, only one British writer was nominated but they did share a win (The Canadians were way overrepresented that year: two of six when Canada has but one ninth the population of the US). In 2009, two of five nominees were British, including the winner (who admittedly lives in the US, I think, but Minneapolis which most people agree should annexed to Canada). in 2008, two nominees were British. in 2006, two nominees were British. In 2005, all five were British. In 2004, back to just one. In 2003, just the one. In 2002, three of six nominees were British. In 2001, two were British. As you say above, all other things being equal, you’d expect the ratio of US: British to be 5:1; if we add in Canadians US:UK:Canada should be 9:2:1 or thereabouts. Both the UK and Canada are overrepresented at the Hugos, going on population and not other factors. An interesting thing about notable Canadian F&SF authors; for some reason they tend to be Canadians by Choice rather than Canadians by Accident of Birth. Granted we have a much higher proportional rate of immigration than the US or the UK so a larger % of us are immigrants and I can see how moving to a new country could inspire the imagination but what’s up with native borns not writing F&SF and how does this relate to questions of national unity (note: within Quebec, please replace ” national unity” with “reasonable accommodation”)? Just a couple of clarifications: obviously all the SH stories on this year’s list were bought during Susan Marie Groppi’s tenure. Also, the editor-in-chief is not involved in fiction editing. Yep, gotcha. It’s more a trend I was trying to highlight there. What does regionality mean with an online magazine? Salon Futura is hosted in the US. Does that make it an “American” magazine?